Most cellular features have a range of states, but understanding the mechanisms responsible for interspecific divergence is a challenge for evolutionary cell biology. Models are developed for the distribution of mean phenotypes likely to evolve under the joint forces of mutation and genetic drift in the face of constant selection pressures. Mean phenotypes will deviate from optimal states to a degree depending on the effective population size, potentially leading to substantial divergence in the absence of diversifying selection. The steady-state distribution for the mean can even be bimodal, with one domain being largely driven by selection and the other by mutation pressure, leading to the illusion of phenotypic shifts being induced by movement among alternative adaptive domains. These results raise questions as to whether lineage-specific selective pressures are necessary to account for interspecific divergence, providing a possible platform for the establishment of null models for the evolution of cell-biological traits. When most people think about evolution, they commonly think of natural selection: the evolutionary force that helps populations to develop toward an optimum state for their environment. The observable traits and features of a cell or organism are known as its phenotype. Under natural selection, genes that produce phenotypes that help a cell or organism to thrive and reproduce are more likely to be passed on to future generations. This means that over several generations the population becomes – on average – better adapted to its environment. Other ‘non-adaptive’ evolutionary forces also influence phenotype. For example, damage to DNA can introduce mutations into the genes that a cell or organism passes on to their offspring. Some mutations are more likely to produce working variants of a gene than others; this is known as a mutation bias. In addition, even in the absence of natural selection, the proportion of particular gene variants in a population changes over the generations because genes are randomly transmitted and not all individuals reproduce. This is known as genetic drift. Together, mutation bias and genetic drift could prevent a population’s average phenotype from reaching an optimal state. Lynch has now developed mathematical models that describe how certain biological features of cells – such as the structure of the proteins they produce – are likely to evolve due to mutation bias and genetic drift. These models show that these evolutionary processes can cause the features of the cells in a population to diversify, which often leads to a suboptimal average phenotype. Lynch calculated that two alternative phenotypes could even emerge in isolated populations in cases where there is only one optimum phenotype. For example, a mutation bias could drive some cells in one population to evolve one phenotype, while natural selection drives another population towards the other phenotype. Overall, the model emphasizes that natural selection is not the only force that drives diversity in cells. Future research into cell biology needs to take a broad view of the joint roles played by natural selection, mutation bias and genetic drift. As with nearly all biological traits, most cellular features vary among individuals within populations in a nearly continuous fashion, owing to genetic differences among individuals and the myriad of stochastic factors experienced by all organisms (ranging from intrinsic cellular noise to external environmental forces; Lynch and Walsh, 1998). This is true, for example, for catalytic rates, rates of gene expression and intracellular transport, numbers and sizes of organelles, etc. Ultimately, some fraction of within-species genetic variation is transformed into among-species divergence as alternative alleles arise by mutation and in some cases proceed to fixation (Wright, 1969; Walsh and Lynch, 2018). The magnitude of such divergence is dictated by three major evolutionary factors: the pattern of selection (the phenotypic fitness function), which imposes a directional and/or stabilizing force on the mean phenotype; the rate of origin and distribution of mutational effects, which define the raw materials upon which natural selection operates; and the power of random genetic drift, which imposes noise on the selective process. Although considerable effort has been devoted to understanding the divergence of mean phenotypes among lineages (Walsh and Lynch, 2018), most of this work is focused on the evolution of morphological phenotypes in response to external pressures, which can vary greatly depending on the ecological setting. In contrast, owing to homeostatic effects, the internal environment of cells remains largely constant over long time scales and broad geographic locations, raising the possibility of establishing general evolutionary principles that transcend the imposition of transient ecological changes. (The same might be true for the internal organs of multicellular species). The goal here is to derive general expressions for the divergence of mean phenotypes among species under scenarios that are likely to hold for a wide variety of cellular traits. The specific focus will be on the magnitude of divergence expected among lineages in the face of identical evolutionary forces, as this helps clarify the degree to which phenotypic diversification can proceed in the absence of lineage-specific selection pressures. Such a perspective is essential to establishing the degree to which adaptive explanations need to be sought to explain patterns of variation among populations. The general approach will draw from well-established constructs employed in the field of quantitative genetics (the study of continuously distributed traits with a multifactorial genetic basis; Lynch and Walsh, 1998; Walsh and Lynch, 2018). The traditional focus of this field has been on complex traits in multicellular species, but these same methods can be profitably applied to intracellular morphological and molecular features, such as those involved in the cytoskeleton, gene expression, binding energy, and metabolic rates (Nourmohammad et al., 2013; Farhadifar et al., 2015; Phillips and Bowerman, 2015). Indeed, although most work in phenotypic evolution proceeds as though cellular details are irrelevant, the models employed may be equally if not more relevant to cell-biological traits, owing to their potentially less temporally variable fitness effects. All genetically encoded traits are subject to the recurrent forces of mutation and random genetic drift, and potentially to selection. Selection favors some genotypes over others, while mutation modifies existing genotypes independent of the selective process, and random genetic drift causes stochastic variation in gene transmission across generations. Owing to this latter factor, even if the forces of selection and mutation remain constant, the population mean phenotype of a trait will wander within a certain range over evolutionary time, with the frequency of occurrence of alternative mean phenotypes depending on patterns and strengths of selective and mutational effects (Figure 1). An idealized overview of the model for the evolution of the distribution of mean phenotypes, given here for a trait under stabilizing selection. The upper panel denotes a hypothetical phenotype distribution at a single point in time. The population consists of multiple genotypes, each having an expected genotypic value (red) but a range of phenotypes (black distributions) resulting from variance in residual deviations (environmental effects and nonadditive genetic factors). The phenotype distribution for the entire population (red) is the sum of these genotype-specific curves, and has a mean denoted by the blue line. The exact location of this overall distribution can wander over time, owing to the joint forces of selection, mutation, and random genetic drift. The lower panel gives the overall distribution of population means over a long evolutionary time span, with 11 locations at specific points of time being denoted by the short vertical lines. Persistent mutational bias towards smaller phenotypes prevents the overall distribution of means from coinciding with the fitness-function optimum, and random genetic drift causes a dispersion of means around the overall average value. The focus of this study, the stationary distribution of mean phenotypes, can be viewed as a summary distribution of: (1) phenotypic means across a large number of replicate populations exposed to identical conditions for a very long period; or (2) a historical survey of mean phenotypes in a single population over a long time period, again under constant environmental and population-genetic conditions. Among many other applications, such an approach has long been exploited in attempts to understand the steady-state distribution of allele frequencies expected under a constant regime of selection, mutation, and random genetic drift (e.g. Wright, 1969). From an empirical perspective, this steady-state view of evolution implicitly assumes that enough time has elapsed between observed taxa that the dynamics of the evolutionary process are of negligible significance (which would not be the case for closely related species). where M(x) defines the rate of directional change (resulting from selection and/or mutation) for a population with mean phenotype x, and V(x) is the variance in change (resulting from drift). C is the normalization constant (containing only terms that are independent of z¯) that ensures that the entire probability density sums to 1.0. For a quantitative trait, the directional term can be subdivided into independent selection and mutation components, Ms(x) and Mm(x), both of which will be discussed in detail below. Under the assumption of negligible genotype × environment interaction and epistasis, the variance of the change in means, which results from the sampling of heritable genotypic values of individuals, is equal to the underlying additive genetic variance for the trait, σA2, divided by the effective population size, Ne, in the case of haploidy (assumed here; and 2Ne in the case of diploidy). The latter is typically far below the number of reproductive individuals in the population, and defined by various demographic features and interference imposed by chromosomal linkage, with values ranging between ∼105 for multicellular eukaryotes to ∼109 for bacteria (Charlesworth, 2009; Lynch et al., 2016; Walsh and Lynch, 2018). showing that the stationary distribution of mean phenotypes (conditional on a particular level of genetic variance, a point that will be returned to below) is proportional to the product of the distributions expected under selection alone and under mutation alone. With extremely weak selection, Ms(x) would be essentially a flat function, with the overall distribution reflecting the biases due to mutation alone. Conversely, with a flat mutation function, an unlikely scenario, the distribution will follow that expected under selection alone. a general statement about the connection between directional selection within generations and the transmission of such change across generations (Walsh and Lynch, 2018). Here, z¯(t) and z¯s(t) denote the mean phenotypes before and after selection in generation t, the difference being the selection differential. The heritability of the trait, h2=σA2/σz2, which equals the proportion of the total phenotypic variance, σz2, associated with additive genetic variation, σA2, constitutes the fraction of the within-generation change in the mean transmitted to the next generation. This expression states that, provided the phenotype distribution is normal, the change in mean phenotype caused by selection is equal to the product of the genetic variance for the trait and the gradient in the logarithm of mean fitness with respect to mean phenotype. Evolution by natural selection comes to a standstill when there is no genetic variance for the trait or the phenotypic mean resides at a point where the slope of the function of mean fitness with respect to mean phenotype is zero. To endow this expression with practical utility, specific expressions for the fitness function, W(z), will be considered below. Most attempts to consider the long-term evolutionary features of quantitative traits have assumed one of two mutation models: (1) a distribution of mutational effects always having a mean equal to zero and a constant variance, independent of the starting genotype (Kimura, 1965; Lande, 1975; Lynch and Hill, 1986); or (2) a rate of appearance of each type of mutant allele being independent of the ancestral type (Cockerham, 1984; Turelli, 1984). 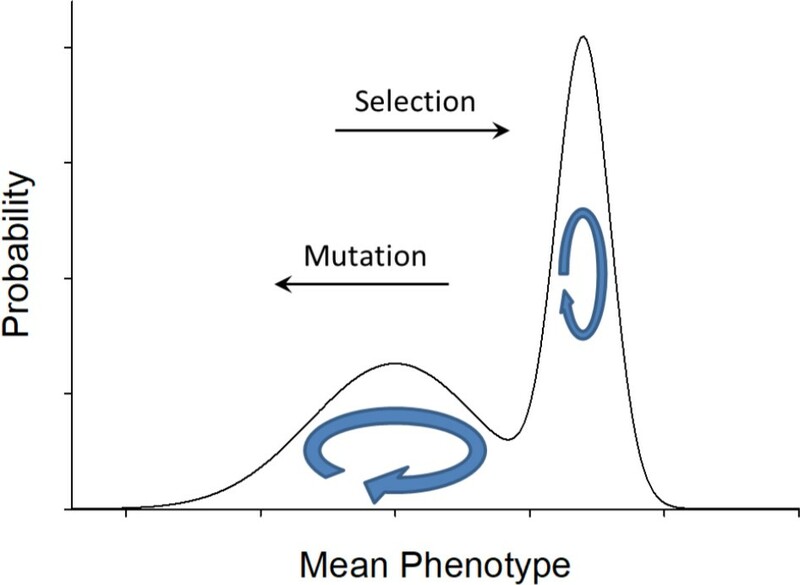 Under the first scenario, mutation has no directional effect on the mean phenotype, and there are no bounds on the possible mutational effects or the physical limits to which the trait can evolve. Under the second scenario, there is a physical limit to phenotypic divergence, and because the directional effect of mutations depends on the current location, more extreme alleles generate mutations with effects biased back toward the center of the distribution. Neither of these mutational schemes captures the features of a wide variety of cell biological traits, which often have finite numbers of possible states and state-dependent spectra of mutational effects. A few examples will suffice to make this point. Protein-protein interactions (e.g. the interfaces between dimeric molecules) typically depend on no more than a few dozen amino-acid sites. The same is true for intramolecular interactions such as the constellation of backbone residues that assemble during protein folding. In both cases, the underlying residues operate in an approximately binary manner, for example, hydrophobic vs. hydrophilic, or hydrogen-bonding vs. non-hydrogen bonding. Likewise, the catalytic sites of enzymes often consist of a small-to-moderate numbers of residues that either facilitate or inhibit catalytic rates, and the sizes of intracellular organelles and cytoskeletal components are constrained by cell size. Many other examples could be cited, including those involved in RNA-RNA and DNA-protein interactions. where z0 is an arbitrary baseline value for the trait, and q¯ is the mean frequency of B-type alleles averaged over all n factors in the population (Lynch and Walsh, 1998). This expression is quite general in that (z¯−θm) is simply the distance of the mean phenotype from that expected under mutation equilibrium, and (u+v) is a measure of the mutational restoring force per locus. The essential feature of Equation (10) is that mutation acts to reduce the distance between the mean phenotype and θm to a degree that depends on the magnitude of this deviation. Charlesworth (2013) implemented a similar mutation model in an investigation of genomic features. with σN2=σA2/[2Ne(u+v)]. As will be discussed below, under neutrality, the genetic variance σA2 often scales directly with Ne, and population size would have no influence on the distribution in this limiting case, as σN2 would be independent of Ne. More generally, σA2 is also a function of the intensity of selection, but the bulk of the steady-state distribution will be represented by mean phenotypes that are in the range of effective neutrality with respect to each other, so the scaling relationship of σA2 under neutrality is expected to be a reasonable first-order approximation. Equation (11) shows that, provided the genetic variance remains roughly constant, the stationary distribution is equal to the product of the expectation under neutrality (where mutation and drift are the only operable evolutionary forces) and the mean fitness function exponentiated by 2Ne, that is, the stationary distribution is equivalent to a transformation of the neutral expectation by a function of the fitness landscape. Thus, to obtain the overall distribution in the following applications, we require an expression for mean population fitness in terms of the trait mean. In what follows, insight into the approximate magnitude of σN2 will be useful. This can be achieved by noting that 2Ne(u+v) will have values of the order of magnitude of 4Neμ, where μ is the mutation rate per nucleotide site. This composite parameter is equivalent to the amount of standing heterozygosity at neutral nucleotide sites in natural populations under mutation-drift equilibrium, and generally ranges from 0.001 to 0.1, with the lower and higher ends of the range being typical in vertebrates and microbes, respectively (Lynch, 2007). Thus, because heritabilities (σA2/σz2) of traits are typically on the order of 0.1 to 0.5 (Lynch and Walsh, 1998), σN2 is expected to be in the range of 1× to 100× the average within-population phenotypic variance for the trait. Application of this expression to Equations (3) and (4) leads to the expression for mean population fitness, which when applied to Equation (7) yields the expression for Ms(z¯) necessary for obtaining the stationary distribution (Table 1). The latter expression shows that the change in the mean phenotype resulting from selection is directly proportional to the deviation of the current mean phenotype from the optimum and inversely proportional to the sum of the squared width of the fitness function and the total phenotypic variance (Lande, 1976). As will be seen repeatedly below, phenotypic variance (an inevitable consequence of external environmental and internal cellular effects) generally reduces the efficiency of selection by diminishing the correspondence between genotype and phenotype. If the mean phenotype were to evolve to the optimum, z¯=θs, which is highly unlikely with biased mutation pressure, selection would be purely stabilizing in nature, operating only to reduce the variation around the mean. Formulae for mean population fitness, W¯(z¯), and the rate of change of the mean phenotype resulting from selection, Ms(z¯), obtained from Equations (4) and (6), respectively. where κ=σN2/σS2, with σS2=(ω2+σz2)/(2Ne) and σN2 (as defined as above) being the variances of the contributions associated with selection and mutation. Equation (13b) states that the grand mean is equal to a weighted average of the expectations under mutation and selection alone (each component being weighted by the inverse of the variance of the function). Equation (13c) states that the variance of means is equal to half the harmonic mean of the variances associated with selection and mutation alone. As σS2→∞, which implies a flatter fitness function and hence an approach toward neutrality, the mean and variance converge on the expectations for a purely mutationally driven process, θm and σN2. As σN2→∞, which implies a weakening influence of mutation on the overall distribution, the mean and variance converge on the expectations for a purely selection-driven process, θs and σS2. With these parameter values in mind, Figure 2 shows that the form of the stationary distribution varies dramatically with the value of σN2/κ=σS2, becoming extremely narrow and extremely flat at opposite ends of the spectrum for this key composite parameter. The degree to which θm deviates from θs for cellular features is unknown, but there is no reason to expect them to be equal. If they differ greatly, μ(z¯) can substantially deviate from the optimum to a degree that depends on the weighting factor κ (Figure 2). 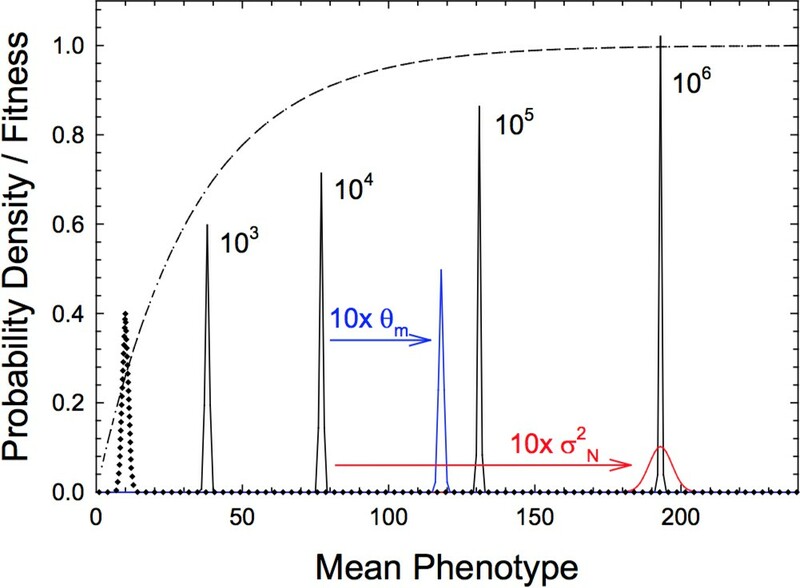 Stationary distributions of mean phenotypes, with optimum phenotype θs=0 and κ=104. Results are given for three different values of θm for the condition in which σN2/κ=10−8 (colored curves), and four different values of σS2 for the case in which the mutational mean coincides with the optimum (black curves). The parametric values used in these plots assume a scale on which the phenotypic standard deviation is 1.0, so a mean phenotype of ±0.001 is equivalent to a shift of 0.1% phenotypic standard deviations from the optimum. where the constants 0≤α≤1 and β≥0, respectively, define the amplitude and rapidity of the fitness response to increasing z. Fitness is equal to 1−α when z=0, and asymptotically approaches one as z→∞. As in the case of the Gaussian fitness function, Equation (13c), the two terms in the denominator are respectively the inverses of the variances expected under the limits of strong selection and neutrality. An example of the influence of population size on the stationary distribution is given in Figure 3, where there is a strong mutational bias away from the optimum. The distributions progressively move to the right with an increase in Ne, with the mean phenotype increasing five-fold over a three order-of-magnitude range of Ne. As can be seen from Equation (16b), equal changes in either Ne or the neutral variance σN2 have identical effects on the mean, although effects on the variance are opposite in direction. Stationary distributions of mean phenotypes with a hyperbolic fitness function, Equation (14) with α=1 and β=0.03 and denoted by the dashed line. 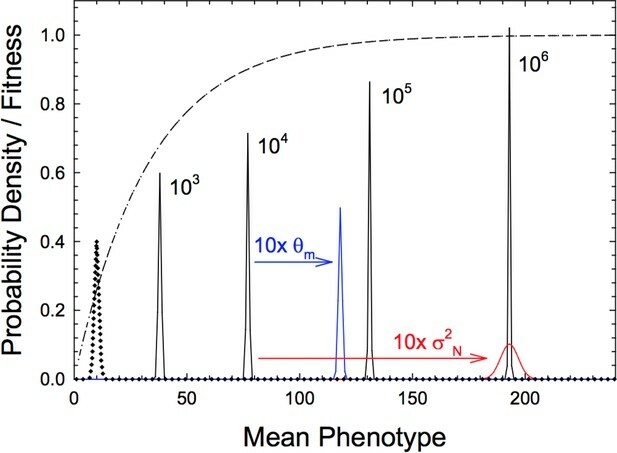 Black distributions denote results for various effective population sizes (Ne=103 to 106), with phenotypic variance σz2=1, mutational variance σN2=1, and the mean phenotype under neutrality (distribution given by the dotted line) θm=10. Blue and red distributions denote the effects of altering θm and σN2. Finally, we consider a variant of the fitness function just noted. With the previous fitness function, Equation (15), the selection gradient progressively declines with increasing phenotypic value over the full range of z, with increasing z resulting in an asymptotic approach to maximum fitness. With a sigmoid fitness function, sometimes called a mesa function (Gerland and Hwa, 2002; Berg et al., 2004), there is an inflection point such that the fitness landscape becomes progressively flatter at both higher and lower values. This means that adjacent variants become increasingly similar in fitness (i.e. more neutral with respect to each other) at both extremes of the phenotype distribution. where erf is the error function (the cumulative standard normal distribution), which facilitates integration with Equation (4). The resultant expression for mean population fitness is also sigmoid, but with phenotypic variance reducing the strength of selection from β to β/γ, where γ=1+(β2σz2π/8) (Table 1). The preceding models are meant to provide heuristic guidance into the evolutionary mechanisms responsible for the dispersion of mean phenotypes of a diversity of subcellular and molecular features. Although such traits may sometimes be under selection for an intermediate optimum, selection may often operate in a continuous directional fashion. In either case, there are two reasons why mean phenotypes are unlikely to commonly achieve states that endow a population with maximum fitness. First, if mutation bias conflicts with the directional effects of selection, the optimum phenotype will not coincide with the mean phenotype. Second, even in the absence of mutation bias and regardless of the form of the fitness function, a drift barrier exists beyond which the gradient of the selection function is not steep enough to overcome the vagaries of genetic drift, thereby preventing further adaptive progress. Within the confines of the drift barrier, the mean phenotype will wander to a degree that depends on the strength of local patterns of mutation and selection. These points have implications for the degree to which the ‘adaptive paradigm’ should be embraced as an explanatory framework for diversification at the cellular level. For example, with mutation bias encouraging the mean phenotype to deviate from the optimum, the result will be a population under persistent directional selection despite the existence of an attainable (but not sustainable) phenotype with maximum fitness. 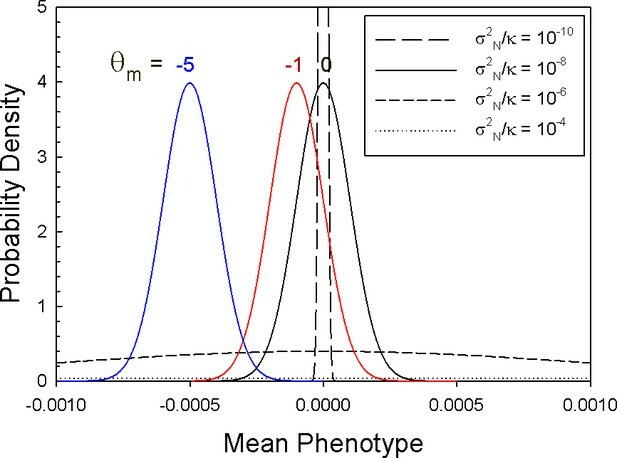 Even without mutation pressure and in the face of intrinsic directional selection, for example, a hyperbolic or mesa fitness function, the most common mean phenotype will not be equivalent to the optimum phenotype, and the drift barrier will ensure variation in mean phenotypes among populations exposed to identical selection pressures. An attempt has been made to couch the stationary forms of mean-phenotype distributions in terms of underlying parameters that are at least in principle observable empirically. Consider, for example, the model for stabilizing selection for a specific optimum. From Equation (14a), the expected deviation of the mean phenotype from the optimum resulting from mutation bias is θm/κ, which expands to θm[ 2(u+v)(ω2+σz2)/σA2 ], a somewhat complex function that may not be immediately transparent. However, a wide variety of models suggest that σA2 scales directly with Neμ provided selection is weak (Bürger et al., 1989; Zeng and Cockerham, 1993; Charlesworth, 2013), and because u and v (the forward and reverse mutation rates) are both proportional to μ (the total mutation rate per site), this implies that the average deviation of the mean from the optimum scales as θm(ω2+σz2)/Ne, or approximately as θmω2/Ne assuming weak selection. Thus, the deviations of phenotypic means from the selective optimum are expected to be inversely proportional to Ne, a point also made by Charlesworth (2013) in a somewhat different analysis. Note, however, that this is only the expected pattern, as the mean phenotype is still expected to drift above and below the expectation to a degree depending on the effective strength of selection. As noted in Equation (14b), and previously pointed out by Lande (1975) and Lande (1976), the magnitude of this drift variance is also inversely proportional to Ne, which implies that the standard deviation with respect to the expected mean scales as ∼1/Ne. Of course, θm (the mean phenotype expected under neutrality) may differ among lineages and the within-population genetic variance σA2 is sensitive to the strength of selection, in which case the power to detect such relationships may be challenging. In addition, the linear scaling of σA2 with Ne is unlikely to continue indefinitely, unless Ne in natural populations rarely attains levels where all constituent loci are saturated with segregating mutations. The salient issue is that the preceding expressions provide qualitative insight into the behavior of mean phenotypes in alternative population-genetic environments, while also revealing the types of measurements that need to be made if we are to understand such behavior. For example, we know essentially nothing about the key mutational (θm) and selection (ω2) parameters for cell biological features and how these might vary among species. This is not a trivial issue, as the influence of both parameters in determining the most likely locations of mean phenotypes are just as central as the role played by Ne. Applying the same logic to results for plateaued fitness functions leads to the prediction that the expected mode of mean phenotypes will scale fairly strongly with the effective population size, in the limit approaching proportionality to Ne, that is, a 10-fold increase in the mean phenotype with a 100-fold increase in Ne. As shown in Figure 3, a simple change in the mutational variance σM2 (with no associated change in mutational bias) can also cause a substantial shift in the position of the mean phenotype. These sorts of observations raise the significant possibility that species with substantially different population-genetic environments may commonly exhibit measurable differences in trait means despite experiencing identical forms of directional selection, again raising challenging issues for those who wish to interpret phenotypic differences as reflections of different underlying processes of selection. Although the data are not extensive, several lines of evidence support the idea that the mean phenotypes of cellular attributes are indeed modulated by the power of random genetic drift. The most compelling example derives from observations on the mutation rate (per nucleotide site per generation), which scales approximately inversely with the 1000-fold range of variation in Ne across the Tree of Life (Lynch et al., 2016). Such a scaling is qualitatively consistent with the drift-barrier hypothesis for mutation-rate evolution (Lynch, 2010; Lynch, 2011), which postulates that because most mutations are deleterious, selection will typically operate to improve replication fidelity, with refinements in molecular performance eventually being thwarted by random genetic drift – as the mutation rate is progressively lowered, there is less room for improvement and hence a narrower range of selectively advantageous replication-fidelity variants accessible by selection. Enzyme efficiency provides a second broad category of traits with evolutionary behavior seemingly in accordance with the theory outline above. For example, Bar-Even et al. (2011) have found that enzymes involved in secondary metabolism are on average ∼30× less efficient than those involved in central metabolism, suggesting that selection operates less effectively on enzymes further removed from core energetic determinants. More directly relevant to the points made above, Bar-Even et al. (2011) also found that prokaryotic enzymes have slightly better kinetics than those from eukaryotes, as expected for species with higher effective population sizes and consistent with the prediction that improvement of enzyme efficiencies will stall once the gradient of the fitness surface is on the order of 1/Ne (Hartl et al., 1985). The fact that bacteria utilize transcription-factor binding-site motifs with stronger affinity to their cognate transcription factors than is the case in eukaryotes is also plausibly related to a higher efficiency of selection in the former (Lynch and Hagner, 2015). Finally, proteins typically evolve to the ‘margin of stability,’ such that only one or two mutations are usually enough to destabilize the folding process (Taverna and Goldstein, 2002; Tokuriki and Tawfik, 2009). Protein stability is deemed to be positively associated with fitness because destabilized proteins are prone to loss of function, aggregation, and/or direct toxicity. Strikingly, however, it is relatively easy to obtain more stable proteins by mutagenesis (Matsuura et al., 1999; Bershtein et al., 2013; Sullivan et al., 2012), with the contributing residues typically interacting in an additive fashion (Wells, 1990; Serrano et al., 1993; Zhang et al., 1995). Moreover, although it is commonly argued that marginal stability is required for proper protein function, with excess stability somehow reducing protein performance, this has not held up to close scrutiny. Many examples exist in which increased stability has been achieved in laboratory modifications of proteins with few if any consequences for enzyme efficiency (e.g. Giver et al., 1998; Zhang et al., 1995; Taverna and Goldstein, 2002; Borgo and Havranek, 2012; Moon et al., 2014). These observations suggest that despite persistent selection for high folding stability, the plateau-like nature of the fitness landscape results in diminishing fitness advantages of increasing stability. A hyperbolic relationship between fitness and the binding energy involving protein stability follows from biophysical principles (Govindarajan and Goldstein, 1997; Taverna and Goldstein, 2002; Bloom et al., 2005; Zeldovich and Shakhnovich, 2008; Wylie and Shakhnovich, 2011; Serohijos and Shakhnovich, 2014), and under this model, proteins are expected to be pushed by natural selection to more stable configurations until reaching the point where any further fitness improvement is small enough to be offset by the vagaries of random genetic drift and/or mutation pressure towards less stable states. Notably, proteins of equivalent length fold at least ten times more rapidly in bacteria than in eukaryotes (Galzitskaya et al., 2011). Moreover, an in vitro evaluation of the folding stability of the dihydrofolate reductase enzyme from 36 species of mesophilic bacteria illustrates the existence of a substantial range of variation among species, with the standard deviation being roughly 10% of the mean (Bershtein et al., 2015). In principle, such a distribution may reflect the dispersion in mean phenotypes associated with drift around the drift barrier. Although the mutation function employed here likely comes closer to approximating the situation for cellular features than do previous functions relied on in quantitative genetics, in reality we do not know the exact form of this function for any cellular feature. Thus, the mathematical theory developed here is best viewed as a guide to approaching the problem at hand rather than as an indelible platform for quantitative analysis. Despite such uncertainties, however, the central feature of the theory presented above is that, regardless of the form of the underlying mutation and selection functions, the stationary distribution of mean phenotypes can generally be viewed as the product of the pattern expected under neutrality alone and the associated function for mean population fitness taken to the 2Ne power, as described by Equations (1a,b) and (11). Similar behavior was previously pointed out for the stationary distribution of allele frequencies (Wright, 1969). Thus, once the key underlying functions have been elucidated, the precise details of the theory can be readily modified with alternative mathematical functions. Finally, a key issue that is not formally evaluated here, but is arguably relevant to a number of cellular features, concerns the matter of peak shifts across the stationary distribution. Questions regarding this matter are typically inspired by Wright’s (1932) metaphor of an adaptive topography, with multiple fitness peaks and valleys of various depths over the phenotypic landscape. However, unless the distribution of mutational effects is completely flat, the relevant topography is not simply defined by the fitness landscape but by the joint action of both selection and mutation. Although the stationary distribution was unimodal in all of the cases examined above, plausible cases exist in which the stationary distribution exhibits two peaks, one largely driven by selection and the other by mutation pressure. For this to occur, the gradient of mutation pressure in one direction has to be of a form such that its product with the selection gradient has an internal minimum (Figure 4). In principle, this can happen when at the intersection of intermediate phenotypes the two functions are sufficiently upwardly concave that their product reaches a local minimum. An example of a bimodal stationary distribution of mean phenotypes, with mutation pressure to the left and selection pressure to the right, with the forms of these two functions being such that their product is a minimum at the valley in the landscape. Most of the time, a population will reside in one domain or the other, wandering over a range of phenotype space to the left or the right of the valley, but occasionally a transition will be made across the valley impelled by a stochastic series of drift and mutational events. Populations crossing the valley to the right are pulled by selection pressure, whereas those crossing to the left are pulled by the multiplicity of mutational opportunities. Under such a scenario, the population mean phenotype is expected to reside in two alternative semi-stable domains for extended periods of time, with the rates of transitions between domains depending on the relative heights of the two peaks, the depth of the distributional valley, and the curvatures of the stationary distribution at the inflection points (Lande, 1985; Barton and Rouhani, 1987). Over long evolutionary time periods, such a system will exhibit detailed balance – the net fluxes will be equal in both directions, with the ratio of the occupancy of the two alternative domains being inversely related to the ratio of the transition rates between them, that is, with the less frequent domain having a higher conditional rate of transition to the more frequent domain. Although the frequency of stationary distributions with multimodal forms is unknown, they have been predicted to arise in some situations involving transcription (Lynch and Hagner, 2015; Tuğrul et al., 2015). Should they exist, the picture from comparative analyses would be one of qualitative changes in mean phenotypes in adjacent lineages. Tempting as it might be to invoke shifting ecological pressures to explain such patterns, they would be occurring in the absence of any underlying changes in selection, being a simple consequence of the multiplicity of mutational opportunities in one direction balanced by selective pressures in the other. Such ideas may be helpful in attempts to decipher the substantial and seemingly disorganized diversity of certain cellular features such as open vs. closed mitosis (Sazer et al., 2014), the structure of the centrosome (Carvalho-Santos et al., 2011), and the variable multimeric states of proteins (Dayhoff et al., 2010; Lynch, 2013; Ahnert et al., 2015) across the Tree of Life. Journal of Theoretical Biology 125:397–418. Current Opinion in Structural Biology 15:447–452. How much heritable variation can be maintained in finite populations by mutation-selection balance? The Journal of Cell Biology 194:165–175. Journal of Molecular Biology 395:860–870. Journal of Molecular Evolution 55:386–400. Proteins: Structure, Function, and Genetics 29:461–466. Sunderland, MA: Sinauer Assocs., Inc.
Genome Biology and Evolution 3:1107–1118. Proteins: Structure, Function, and Bioinformatics 82:1947–1959. Current Opinion in Genetics & Development 23:684–693. Molecular Biology and Evolution 31:165–176. Journal of Molecular Biology 233:305–312. Journal of Molecular Biology 420:384–399. Why are proteins marginally stable? Proteins: Structure, Function, and Genetics 46:105–109. Current Opinion in Structural Biology 19:596–604. Proc. Sixth Internat. Cong. Genetics pp. 355–366. Evolution and the Genetics of Populations, The Theory of Gene Frequencies, 2, Chicago, IL, Univ. Chicago Press. Annual Review of Physical Chemistry 59:105–127. Protein Engineering, Design and Selection 8:1017–1022. Thank you for submitting your article "Phylogenetic Divergence of Cell Biological Features" for consideration by eLife. Your article has been reviewed by two peer reviewers, and the evaluation has been overseen Naama Barkai as the Senior and Reviewing Editor. The following individual involved in review of your submission has agreed to reveal his identity: Joe Felsenstein (Reviewer #2). Please address all comments below most of which can be addressed with suitable changes in the text. Others require a response which the reviewers will consider in rendering a final determination. I reviewed this manuscript with a PhD student from my laboratory. Whether cellular traits are at the optimal configuration allowed by biophysical constraints in any organism is unknown. As was shown in population genetics, genetic drift could play an important role in preventing traits from reaching this optimum. However, biased mutation pressures could also contribute to drive average phenotypes away from their optimum. The extent of this effect is unknown. This paper addresses the evolution of cellular traits, particularly the relative contribution of natural selection, mutation and genetic drift on their evolution and divergence among populations or species. Lynch develops a theoretical framework to identify the conditions in which phenotypes can be driven away from optima by biased mutational pressure. 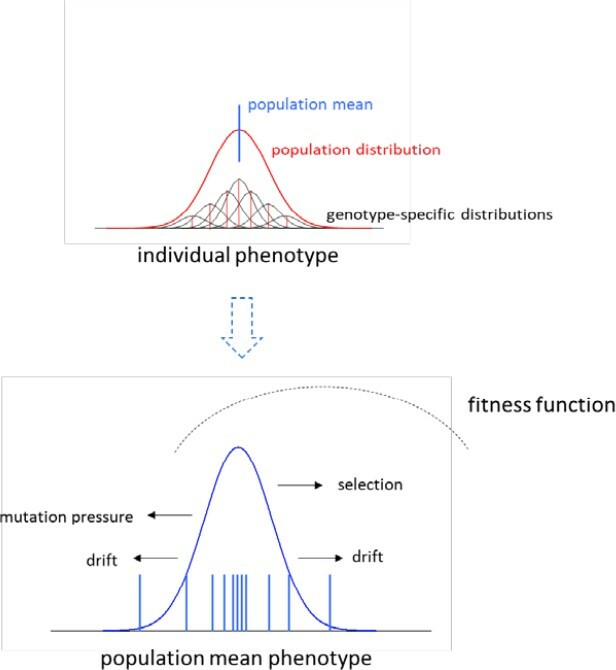 He also introduces different fitness functions that likely apply to cellular traits and shows how these fitness functions interact with various mutational effects to affect the expected stationary trait distribution. The paper is well written and the findings are important because, among other things, they stimulate new avenues of investigation in cell biology. The presentation however could limit the accessibility of the manuscript to the broad audience of eLife. It would be useful in the Introduction to mention why cellular traits require a special treatment and approach, and why they cannot just be considered as other quantitative traits. The author mentions that since they evolve in a relatively stable environment due to homeostasis, cellular traits could be under relatively uniform selective pressure, even among distinct lineages. However, wouldn't that be true for internal organs also in multicellular species? Also, homeostasis is the result of these cellular traits interacting with the environment, so it cannot be considered as an independent factor. Maybe cellular traits are just a special case of slowly evolving traits? The first paragraph of the Introduction appears to be reporting observations that are commonly known for evolutionary biologists. However, eLife not being specialized in evolution, it could be useful to cite some general references for these statements. The second paragraph of the subsection “The Process of Mutation” could also be supported by more references, same thing for the Discussion. Along the same line, the readership of eLife would appreciate some graphical and simplified representations of the processes described with equations, some sort of graphical summary of the paper. The Introduction mentions examples of cellular traits. It could be useful to mention them earlier to introduce what cellular traits are. The paragraph above Equation 1B: does this partition of the variance of z implicitly assumes that the parental average (A) does not covary with the deviation from additivity (e)? It would be clearer to briefly state this assumption. Some stochastic effects in cell biology could be noise factors that are correlated positively or negatively with the average effects. Finally, I do not have the skills required to fully verify the validity of the different derivations and mathematical assumptions presented. I assume another reviewer will have done so. This is a very interesting and important paper. Where a lot of us have been deterred from thinking hard about this by the worry that characters at the molecular level might involve too few genes to be successfully modeled by the machinery of evolutionary quantitative genetics, Lynch has plunged in and obtained some very interesting results. I have several substantive questions, and then a bunch of suggestions for clarity. 1) “distributions expected under selection along and under mutation alone” are invoked. The latter I can see. But the former is not obvious. I get the impression from the equations that this is the distribution that would result under selection-versus-drift when the additive genetic variance is held constant at σ 2 A. So there is some kind of assumption that, in the case of “selection alone”, selection does not erode the additive genetic variance. 2) “evolution by natural selection comes to a standstill where.… the phenotypic mean resides at the point where the slope of the fitness function is zero.” I wonder whether that is true. I recall that if the fitness function (curve of fitness as a function of phenotype) is a mixture of two Gaussian peaks, one smaller than the other, where the phenotypic mean will come to a standstill depends on the slope, not of that fitness curve, but of the fitness curve where each component is fattened by the additive genetic variance. That can be quite different. Or do I misunderstand what is being said here? 3) The mathematics here uses compound parameters which determine the final equilibrium distribution. However should it not be noted that these do determine the time dynamics in a population. If one is looking at a phylogeny of species, rather than species that have diverged long enough that each is in its equilibrium distribution, one does need the parameters that determine the time dynamics. This should at least be mentioned, as multispecies data tend to come to us at the tips of phylogenies. […] It would be useful in the Introduction to mention why cellular traits require a special treatment and approach, and why they cannot just be considered as other quantitative traits. The author mentions that since they evolve in a relatively stable environment due to homeostasis, cellular traits could be under relatively uniform selective pressure, even among distinct lineages. However, wouldn't that be true for internal organs also in multicellular species? Also, homeostasis is the result of these cellular traits interacting with the environment, so it cannot be considered as an independent factor. Maybe cellular traits are just a special case of slowly evolving traits? I have attempted to reword the Introduction a bit, and elaborate elsewhere, to accommodate the reviewer’s points here. I do not mean to imply that cellular traits need to be treated differently than other classical quantitative traits, but rather that due to relative homeostasis (and the likely more constant selective environment), they may actually fulfill the assumptions of the models better. The point about internal organs is interesting, and has now been mentioned. As requested, additional references are cited – the Lynch and Walsh / Walsh and Lynch books give a very broad and up-to-date overview of theoretical and empirical basis of quantitative genetics. I have also attempted to produce a figure that I hope will soften things a bit and provide additional clarity. This is now mentioned explicitly in the first paragraph of the paper. This is now stated explicitly at the designated location. […] I have several substantive questions, and then a bunch of suggestions for clarity. 1) “distributions expected under selection along and under mutation alone” are invoked. The latter I can see. But the former is not obvious. I get the impression from the equations that this is the distribution that would result under selection-versus-drift when the additive genetic variance is held constant at σ 2 A. So there is some kind of assumption that, in the case of “selection alone”, selection does not erode the additive genetic variance. Yes, I believe that is the correct interpretation, and this is now stated explicitly and elaborated upon more in the Discussion, with further justification noted in the section on the stationary distribution. I have reworded things to make clear that the formulation is referring to mean population fitness with respect to the mean phenotype, under the stated assumption that the phenotype distribution is normal. Yes, this is an important point, and at the beginning of the section on the model, I now state “From an empirical perspective, this steady-state view of evolution implicitly assumes that enough time has elapsed between observed taxa that the dynamics of the evolutionary process are of negligible significance (which would not be the case for closely related species). I thank M Bauer, J Felsenstein, P Higgs, P Johri, M Lässig, M Manhart, A Moses, and D Needleman for helpful comments. This research was supported in part by the National Science Foundation under Grant No. PHY11-25915 to the Kavli Institute of Theoretical Physics. Support was also provided by the Multidisciplinary University Research Initiative awards W911NF-09-1-0411 and W911NF-09-1-0444 from the US Army Research Office, National Institutes of Health awards R01-GM036827 and R35-GM122566-01, and National Science Foundation award MCB-1518060. © 2018, Lynch et al.